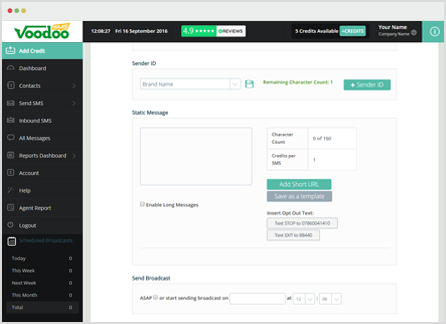 The Voodoo SMS platform enables the broadcaster to enter a maximum 11 alphanumeric characters in the Sender ID field, and this can be a great way to develop brand identity in your campaigns. It can be a powerful marketing tool to have the text message appearing to come from your company name. A unique functionality of our platform is the ability to send a SMS campaign so that the text message appears to be sent from a mobile or landline number. This can be particularly useful where you wish the recipient to respond to a particular telephone number (e.g. the mobile number of your Sales Manager or even your Sales number). Our system requires the Voodoo SMS account holder to first verify each of these telephone numbers, to ensure that number is authorised to communicate on behalf of your organisation. This additional security level is for your benefit, as it will prevent 'number spoofing', where a message appears to be from someone other than the actual sender. Your Voodoo SMS account will save all Sender IDs that you use (and have verified where required), so you can use again in all future campaigns.